This article was originally published at ComicBook.Com on October 30, 2014. Hellboy and the BPRD #1 marks the exciting return of Hellboy to the land of the living (albeit in 1952) and is headlined by a powerhouse team up of creators. Hellboy and B.P.R.D. scribes Mike Mignola and John Arcudi are providing the script for two Eisner award-winning artists, Alex Maleev and Dave Stewart. It’s hard to believe that Maleev has never contributed to the wide collection of Mignola-verse stories outside of a short story in Hellboy: Weird Tales. His style and skill mesh perfectly with the storytelling that has come to be expected from series like Hellboy, B.P.R.D., andBaltimore. Yet this is the first time he has worked with Mignola or Arcudi on a series and the results are just as effective as one might imagine. Maleev strikes a balance in his panels between being moody and grounded. The various members of the BPRD team all appear natural in their appearance and gestures (or at least as natural as a young man from Hell can). The world they occupy is not meant to reflect our own though and avoids realism. Maleev’s compositions of landscapes are heightened. He imagines things that could exist and then twisting them for maximum visual impact. Maleev strikes a tone where nothing is beyond belief (yet), but everything is slightly bigger than reality. Stewart’s colors help to create much of the tension found in this issue. The events of the comic are largely unthreatening, but the atmosphere is palpable. Upon landing in Brazil at dusk, there is a darkness that looms over these characters and the countryside around them. An abandoned castle and old church both serve as ominous landmarks when presented through Stewart’s palette. He focuses on mellow earthen tones as the comic begins, but as it draws closer to its conclusion they darken. Warm yellows and oranges are replaced with greens that could have crawled from a swamp. The blacks that consume the land are inescapable by the final pages. 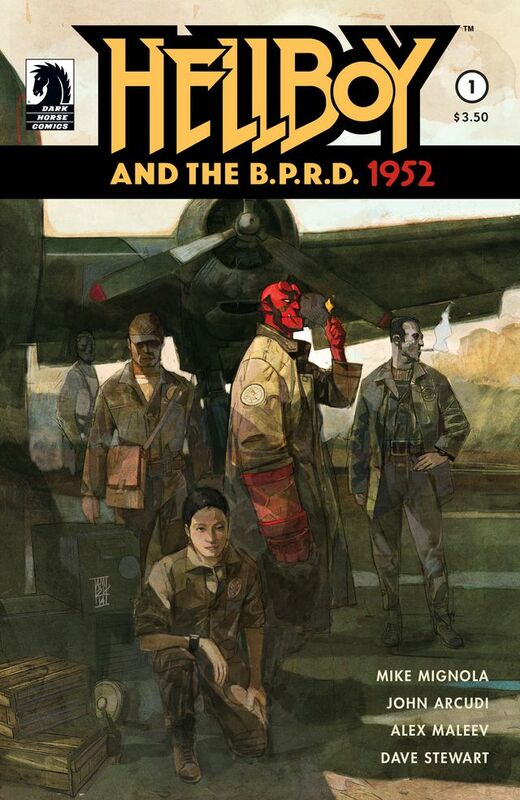 Together, Maleev and Stewart create an undercurrent of tension to set the mood of Hellboy and the BPRD #1 in a subtle fashion. They allow Mignola and Arcudi to focus on establishing elements of plot. Early in the issue a new team of four BPRD agents who Hellboy will accompany on a field mission are introduced. Brief text boxes are provided to give names and basic information, but the characterization all comes in the form of speech bubbles. By the end of the issue, each of these four resembles a human being with a distinct history and personality. The manner in which they speak and how they interact constantly serve to inform readers of who these four people are. Hellboy and Professor Bruttenholm are known quantities, but these new cast members are made to feel every bit as important by the final page. Hellboy and Bruttenholm are both markedly transformed here. The issue is structured to shift between their two perspectives at its midway point. Bruttenholm is a much younger man haunted by self-doubt here. Hellboy’s presentation is the far more interesting change though. His dialogue is written by Mignola, but is very limited. This story serves as something of an origin for the character and presents him as someone coming to understand the world. Maleev’s panels show him constantly looking around, awe struck by what he sees. It’s a fascinating turn on a character known for his rough personality and unflappable demeanor. Hellboy and the BPRD #1 is the first act of an excellent horror film. It establishes its characters and conflicts without relying on cheap tricks. Instead the actions in this comic are allowed to breathe and the characters are provided with depth and weight. There is tension within Maleev and Stewart’s artwork, but it is subtle and bides its time waiting to build as the story advances. It should be expected that a team like Mignola, Arcudi, Maleev, and Stewart would create an excellent comic and that is just what they do.